Zalora, the country’s online destination for lifestyle and fashion, will offer 12% off on all items from trendy clothing and chic home décor to cool sports gear and even stylish accessories to everyone who purchases from 12AM to 1AM and 12PM to 1PM on 12/12/12. NOISE day also kicks off the special Zalora 12 days of Christmas sale- offering even more exciting discounts on a different category each day for the 12 days leading up to Christmas eve. Not to be outdone, Lazada, the Philippines’ Online Shopping Mall offers a huge discount of 30% and up on 8 products each for their 12 categories, giving consumers the best deals on gadgets, books, baby essentials, beauty products and more every hour starting at 8AM until 8PM. To make this even more exciting, Lazada Philippines will be having an hourly raffle draw for their shoppers with the grand prize of PhP 121,212 worth of Lazada Gift Certificates! Groupon Philippines will be having a 12-hour Flash Sale from 12 noon to 12 midnight. Subscribers will be able to avail of an additional 12% discount on selected local deals, including restaurant vouchers, spa deals, and more. In addition, free credits will given to loyal Groupon subscribers. Experience your city for less with Groupon! 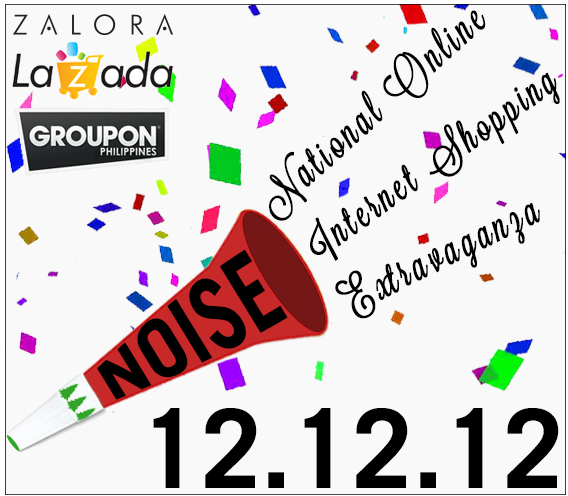 12.12.12 is shaping up to be the online shopping event of the year- don’t get caught standing in line or waste time stuck in traffic-just log on and start spreading the NOISE!